Vertical Roof units are designed with an “A” frame roof truss and vertical roof panels. Hat channel runs the length of the unit to cross brace the roof and provide a mounting point for the roof panels. This design helps to prevent weathering elements such as rain and snow from “standing” on your building. Vertical Roof units come standard with ridge cap and specially designed wider trim that give the product a modern, finished appearance. This unit is available in widths from 12’ wide up to 40’ wide and side wall heights up to 14’. Length from 21’ and up in 5’ increments. Prices starting out at $1595+tax for 12 x 21 x 6 price includes installation on your level site. 1) Do your carports meet Florida code? Yes, All our steel products meet code. 2) Can I save money buying my carport directly from Carolina Carports, Inc? No, we are very loyal to our dealers and you will better understand our product if you see it first hand on display with our dealers. 3) What size do I need to pour my cement slab? You should pour your cement slab 3/4" wider and 1' shorter in length. 4) What are the dimensions of the carport outside to outside? It is Width x Length x Height. 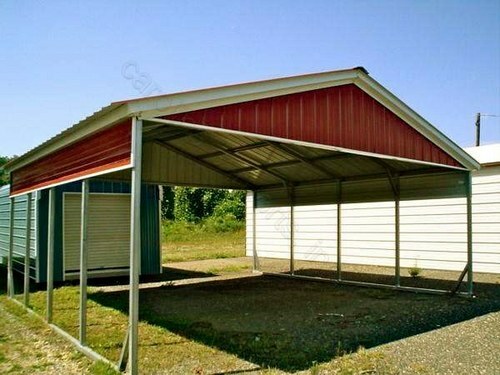 Example: 18 x 21 x 6 carport size, 18 x 20 x 6 base size. Note: Length dimension measured by the roof metal having a 6" overhang on each end so the bottom base rail is one foot shorter than the roof. Width is measured from outside base rail to other outside base rail. 5) What is the highest leg height I can get? 12' is he highest we will go. Note: If you want a higher leg height than 12', it must be approved. 6) How much adjustment do you have to level your carport? You have about 3" to 4" to adjust. 7) When are the extra 4' braces recommended? When the leg height is 8' or taller on all sizes and with all 22' and 24' wide units. 8) Can you add to your carport after it's already installed? Yes. There will be a small service charge; if the original carport was ordered from CCI; and if you want to add walk-in doors or garage doors to your carport, the original carport must be 6' or taller. 9) What types of anchors do you use? We have 3 different types of anchors: 32" rebar anchor for ground and asphalt installation; double helix mobile home anchor for ground installation only; and wedge anchor for concrete installation only. 10) What is the pitch in the center of the carport? The pitch varies depending on the width of the carport. It could be from 2 1/2' to 4'. "We are very happy with the product and the quality of service! Enjoyed everyone.[...]" © 2002-2019 Tampa Sheds All rights reserved.